In collaboration with Jacob’s Pillow, the award-winning choreographer, praised for how “…his sprawling movement pieces fold history into the present” (The New York Times), is in residence at the Pillow Lab and Hancock Shaker Village this winter/spring as he prepares for the world premiere of his newest work, POWER, at Jacob’s Pillow in July. A special, site-specific experience titled …they stood shaking, while others began to shout will be presented at Hancock Shaker Village in the 1826 Round Stone Barn. Wilson often explores in his work the importance of houses of worship in the world of dance. After spending time at Hancock Shaker Village and the Pillow Lab, he is creating an intentionally-crafted work that will premiere July 10-14 at the Doris Duke Theatre as part of Jacob’s Pillow Dance Festival 2019. The site-based event at Hancock Shaker Village on Saturday, July 6 will feature members of the Fist and Heel Performance Group in a dance performance that promises to weave Hancock Shaker Village’s historic buildings and landscape into a thought-provoking narrative. Fist and Heel Performance Group is a Brooklyn-based dance performance group created by Reggie Wilson in 1989. 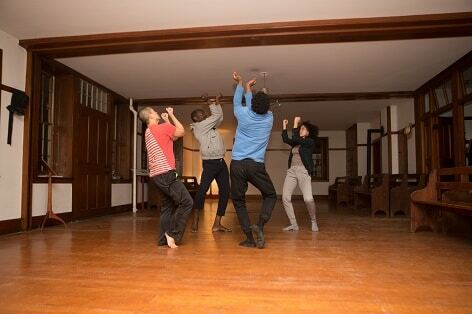 The group blends contemporary dance with African traditions in what the founder and choreographer terms “Post-African Neo Hoodoo Modern dance.” An inaugural Doris Duke artist, Wilson is a graduate of New York University, Tisch School of the Arts. He has studied composition and been mentored by Phyllis Lamhut; he has also performed and toured with Ohad Naharin before founding Fist and Heel. He has lectured, taught, and conducted extended workshops and community projects throughout the United States, Africa, Europe, and the Caribbean. His work explores connections between secular and spiritual cultures of the African diaspora in the Americas. “Audiences are drawn to his unique synergy of formal rigor, playfulness and depth” (Dance Magazine). While in residence at the Pillow Lab, Reggie Wilson and his creative team and collaborators have been researching and have been inspired by the Hancock Shaker Village archives, which include textiles (1,200 examples of Shaker costume, domestic textiles, and specialty products made and used by the Shakers or sold to outsiders and other Shaker communities), commercial graphics (1,300 artifacts, including labeled seed packages and boxes), and archival materials (2,000 imprints and 10,000 photographs, as well as journals, letters and manuscripts). For this choreographer’s creative process, access to the wealth of archival information and the actual physical elements of Hancock Shaker Village have been refreshing old questions and triggering new thoughts about the Shakers. Long fascinated by the Shakers, Wilson was curious in particular about Mother Rebecca Cox Jackson, a black woman born in 1795 who founded a Shaker community in Philadelphia. Considered in their time to be innovative and progressive thinkers (the Shakers believed in racial and gender equality centuries before the world caught up, and in a manifesto in 1885 chided the government for not allowing women to vote), the Shakers believed that all were equal, and allowed anyone to join their communities. Once a commitment to communal life was made, members were then obliged to turn over their property and material wealth to the community. The Shakers welcomed African American members into their communities as early as the late 1700s, assisted fugitive slaves along the Underground Railroad, and would often purchase the freedom of slaves in southern communities. The Shakers wrote more than 25,000 songs (more than all the ballads and spirituals known to have originated in America), and danced to most of them. Shaker villages from Maine to Kentucky resounded with passionate, beautiful dancing on a daily basis. Indeed, they are called Shakers because of their ecstatic worship. This dance project will launch Hancock Shaker Village as a refreshing historical location to experience yet another art form and serve as a reminder that dance was an intense physical expression of Shaker spirituality. For more information about Reggie Wilson/Fist and Heel Performance Group click here. Joan & Jim Hunter, Julie Mehretu, Dr. Bruce & Reba Evenchik, Robin Lazarow & Jeanne Kangas.